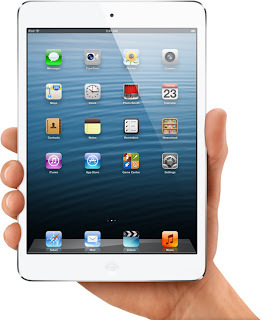 APPLE iPAD Mini Got priced at $329 : WHY?? The new iPad Mini got priced at $329. With a 7.9-inch screen, iPad Mini is smaller and less expensive than the traditional 10-inch model, but will support similar functions and apps. Apple marketing wizard Phil Schiller defended the $329 price of the new iPad mini tablet, saying consumers will be willing to pay for quality not found in less expensive devices from rivals like Google and Amazon. The iPad mini hits the stores in the US from November 2 but Apple has not disclosed its price for Indian markets or the launch dates. The iPad Mini has the same resolution as the iPad 2, also includes a dual-core A5 processor, a front-facing FaceTime HD camera, Apple's ‘Lightning’ connector and a 5-megapixel back camera. Google, meanwhile, is expected to reverse Apple’s strategy in coming weeks, by launching a 10-inch version of the Nexus. But, the iPad Mini is expected to attract buyers attention by its compactness and its portability. Inspite of the price tag, it still didn't take away the sting for many potential buyers of the 7.9 inch tablet. "The iPad is far and away the most successful product in its category. The most affordable product we've made so far was $399 and people were choosing that over those devices. And now you can get a device that's even more affordable at $329 in this great new form, and I think a lot of customers are going to be very excited about that...Others have tried to make tablets smaller than the iPad and they've failed miserably. These are not great experiences. "-Phil Schiller, Senior VP worldwide marketing, Apple. Apple has maintained its premium brand tag and priced Mini starting at $329 against $159 for the cheapest Kindle Fire and $249 for the Nexus 7. Apple is under maximum pressure to maintain its position in the worldwide market. 0 Respones to "APPLE iPAD Mini Got priced at $329 : WHY??"